Tool specialist KS Tools now includes a line of fastening clips in its product range and at the same time has developed a tool for locating them. 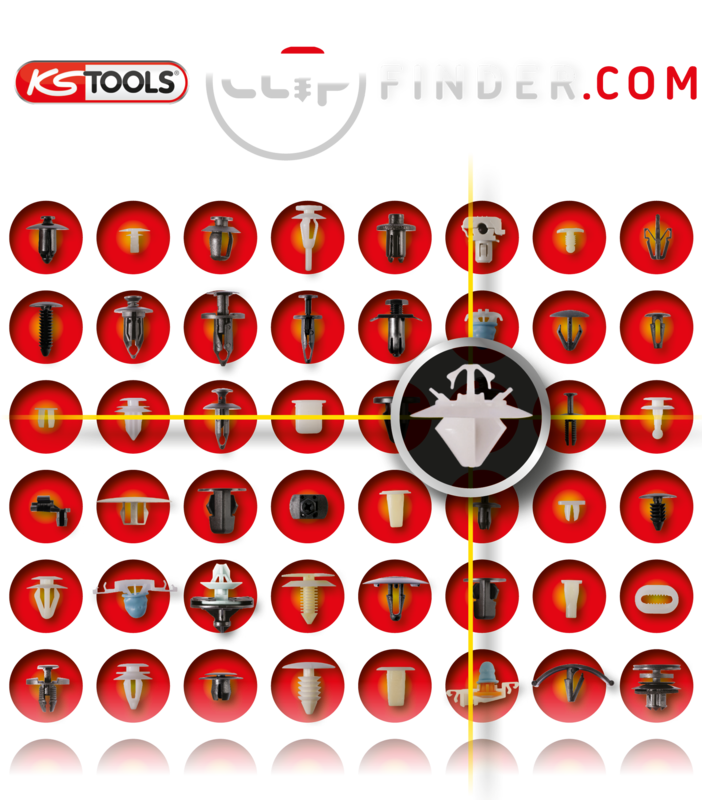 The Clipfinder at www.clipfinder.com assists workshops in quickly and effortlessly identifying the right clip for a vehicle. As well as a whole host of clip varieties sorted by vehicle makes, cross-brand universal varieties are also offered. So the professional always has the correct clip to hand. The main attraction of the Clipfinder is the option of being able to hold an existing clip up to the screen to compare it with the 1:1 illustration of the part identified in the internet. This works like a charm on the monitor screen. „Sometimes the devil is in the detail“, declares the KS Tools project management. „Clips often look similar and also appear at first glance to suit the corresponding application. Later it transpires that the wrong part has indeed been resorted to.“ Then in the extreme case the panelling comes loose or a loose fitting clip can cause irritating rattling noises which are also difficult to localise later on. With the Clipfinder, identifying the clips is quite simple. The most important step when using for the first time is to calibrate the monitor screen. Using a ruler, the Clipfinder is set so that the photos lodged in the program can be compared directly 1:1 with the original clip. A huge help in selecting clips. Alternatively, simply enter the screen diagonal measurement. Besides this, the mechanic can identify the clips by entering the OE number. You only have to enter the correct number in the appropriate field and the corresponding KS Tools clip is displayed immediately. This works not only on a PC plus monitor but also on a laptop, tablet or Smartphone. Clips mostly have to be renewed after a repair as they are invariably damaged on removal. It is especially at low temperatures that the material is brittle so that the clip breaks at the latest when being refitted. If that isn‘t noticed, the clip has no function and rattles or falls from its holder at the first opportunity. KS Tools now offers a whole array of clips which cover the most important applications of these small plastic parts. A total of 21 sets form the right inventory to be armed for all eventualities. The clips are available singly or as a set in a practical carrying case. These contain the most common models so that the correct clip is always at one‘s fingertips.